As the owner of two dachshunds, I ordered this book to my library. When it arrived, I was charmed by the cover. A black and tan dachshund, resplendent in a hand knitted red sweater, trots alongside the gangly legs of wolves with his tongue flapping in the breeze. Of course, all we see is the legs, since our stalwart hero is a shorty-short-short. The story is like this: life has gotten dull. Weiner Dog lives high on the hog with Granny, but he’s in a rut. As Crosby intones, “His toy had lost its squeak.” Epiphany arrives with the advantageous screening of a nature show where wolves howl in the great wide yonder. Weiner Dog is entranced. Weiner Dog is inspired. Weiner Dog is going to change his life! Arrrooooooooo! Hightailing it (chuckle) out of Granny’s comfortable living room, he hitches a ride to the State Park. The wilderness was wild and accommodating, and he noses around looking for… friends? His apprehension is palpable as he stares down a pack of snarling wolves. Tail tucked, Weiner Dog thinks it over, and understands their hesitation. Shedding the confines of civilized life (his comfy red sweater) he becomes more than a pet. More than a dog. He becomes…Weiner Wolf! He answers the call of the wild with a bold Arrrrooooooooooooo! Though he dreams of Granny, he knows the wilderness will set him free. He has a new, bigger, wilder backyard. His water bowl is a cold mountain stream. His squeaky toys are real live wolf cubs. Life is good. Until he sees a side of nature he didn’t anticipate. Will Weiner Wolf stay the course, or will he answer the call of the Granny? Read and find out. About the Author: Jeff Crosby is an accomplished illustrator, with works appearing in the New York Times, the Village Voice, and Entertainment Weekly as well as seven children’s books. Partnering with his wife, Shelley, he has co-authored and co-illustrated the award-winning juvenile nonfiction book Little Lions, Bull Baiters & Hunting Hounds: A History of Dog Breeds. His website is www.jeffcrosbyillustration.com. And yes, he is the owner of two weiner dogs. 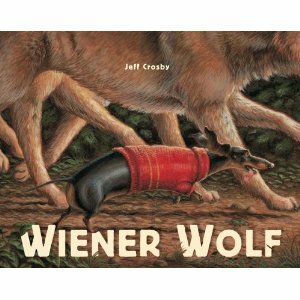 This entry was posted in Books and tagged Children's books, Dachshund, dachshunds, Granny, Jeff Crosby, knitted sweater, Picture book, weiner dog, wolf, wolves by S.D. McPhail. Bookmark the permalink.